Learn more about our document protection options. 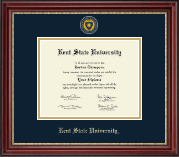 Features a custom-minted medallion of your school seal enhanced with hand-painted color enamel accents within navy and gold museum-quality matting and the school name is gold embossed below. It is framed in Kensington Gold moulding crafted of solid hardwood with a cherry finish and gold inner bead. 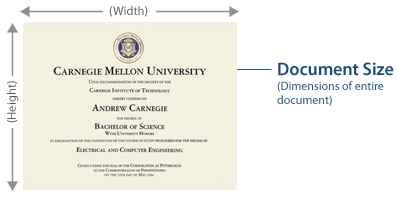 This frame fits an Associate's and Bachelor's degree. Includes our easy-to-use Level-Lock Frame Hanging System!